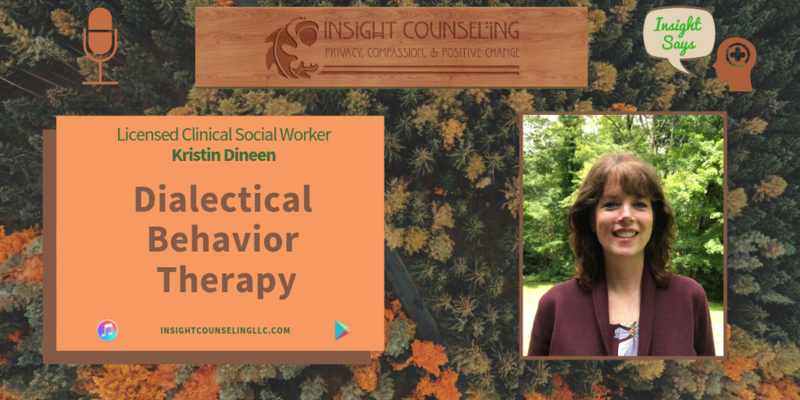 During this podcast episode, Kristin Dineen, a Licensed Clinical Social Worker at Insight Counseling teaches about Dialectical Behavior Therapy (DBT). 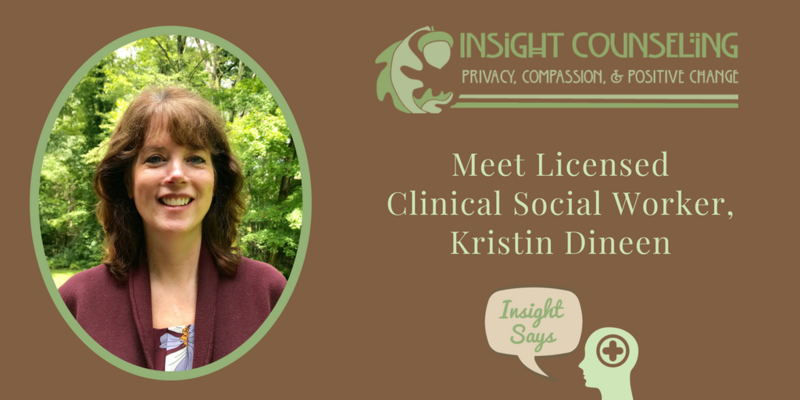 Kristin Dineen brings over 30 years of experience in treating adolescent and adult clients experiencing anxiety, depression, substance abuse and other difficulties. She has worked in a variety of settings including hospitals, inpatient treatment for addiction, outpatient programs and in school systems. Kristin received her Masters in Social Work from Fordham University. She is trained in Dialectical Behavior Therapy, a skills-oriented therapy model focused on emotions with a cognitive and behavioral component. Kristin facilitates a DBT group for teens focusing on developing skills to be in control of emotions, tolerate stress and improve communication. Stay tuned for the next new episode of “Insight Says”! New episodes are released every month. See what else we are up to on Twitter, Facebook, Instagram, and LinkedIn. Questions/inquiries can be sent to info@insightcounselingllc.com. 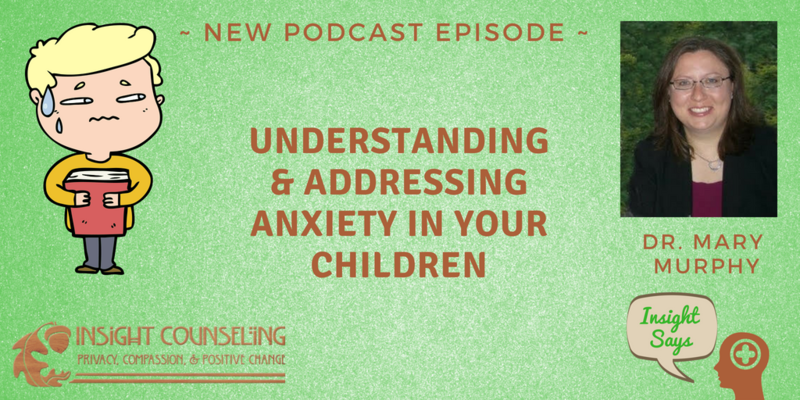 On this episode of Insight Counseling’s podcast, “Insight Says”, Dr. Mary Murphy explains how parents can understand and address anxiety in their children. Dr. Murphy is a licensed clinical psychologist who specializes in counseling, executive functioning, academic coaching, and biofeedback. She is the Director of Psychology and Testing Services at Insight Counseling. She completed her PhD doctoral training at the Albert Einstein College of Medicine and fellowship training at Yale University School of Medicine. Dr. Murphy also holds a Connecticut state license in substance abuse counseling. She has extensive training and experience in psychological testing needed to diagnose children and adults. A large part of her current practice is providing comprehensive psychological evaluations needed for student 504s and IEPs. Her counseling practice focuses on helping adolescents and adults with ADHD, concussion, depression, anxiety, and substance use. Stay tuned for the next new episode of “Insight Says”! New episodes are released every month. See what else we are up to on Twitter, Facebook, Instagram and LinkedIn. Questions/inquiries can be sent to info@insightcounselingllc.com. 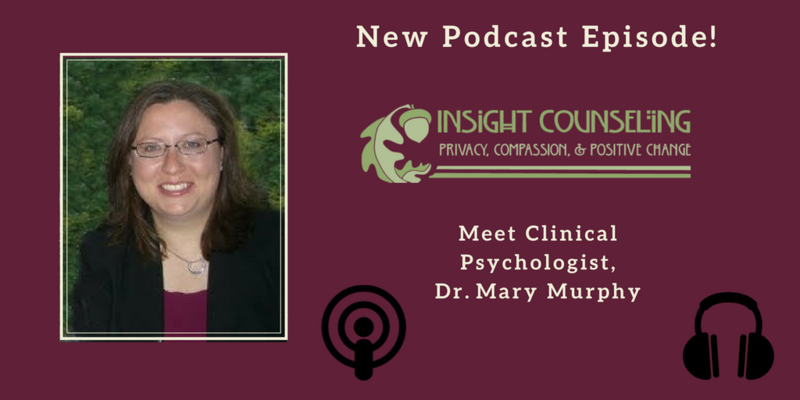 Meet Dr. Mary Murphy on this episode of Insight Counseling’s podcast, “Insight Says”. Dr. Murphy is a licensed clinical psychologist who specializes in counseling, executive functioning, academic coaching, and biofeedback. She is the Director of Psychology and Testing Services at Insight Counseling. She completed her PhD doctoral training at the Albert Einstein College of Medicine and fellowship training at Yale University School of Medicine. Dr. Murphy also holds a Connecticut state license in substance abuse counseling. She has extensive training and experience in psychological testing needed to diagnose children and adults. A large part of her current practice is providing comprehensive psychological evaluations needed for student 504s and IEPs. Her counseling practice focuses on helping adolescents and adults with ADHD, concussion, depression, anxiety, and substance use.